Your Source for Everything You Need to Know About Solar. When a solar power system gets installed on a roof or ground mounts, the most common type of solar panels used are photovoltaic (or “PV”) panels. The panels absorb light particles, called photons, from the sun. These particles then flow through the semi-conductive materials in the panels, creating an electrical current. Solar panels will convert the captured sunlight to DC electricity. An inverter then converts DC electricity to AC, which powers your home or business. Current technology has produced sleek black solar modules that aesthetically complement any architectural style. The process of installing a solar system is less complicated than you might think. The first step we encourage you to take is to collect your most recent electric bill from your utility company. You can then take this short quiz to see if your home or business is right for a solar installation or community solar. The quiz will ask things like: age of your roof, whether you own or rent, and your average monthly energy bill. Once you’ve taken these steps, we will work with you to determine your best installation and financing options. Get clean, green affordable energy. What are the key aspects of solar for my home? The basics of home solar are pretty simple. There’s just a few things you need to be familiar with to understand how to set up a proper system. Net Metering is the policy that allows you to push and pull energy to and from the grid through your electrical meter. Traditional utility users pull energy from the main grid, use the energy in their home, and the meter counts how much is used. With solar, you will push your excess energy into the grid during the day and pull it out at night to use for lights, TV, A/Cm or anything else you may need. After you go solar, you will still be connected to the grid. This is so you can take advantage of Net Metering to maximize the value of your system. Essentially the grid functions as a bank storing your energy from your solar panels until you are ready to use it. With a battery backup system and secure power supply, you can use the energy from your system when the grid goes down. If you don’t use all the energy your system produces in a day, that energy will roll over to the next day and so on. This happens day after day, month after month. This allows you to use all the energy you produce with your solar system. If you have higher usage months (AC, guests, holidays, etc) you draw from the extra energy credits you earned earlier in the year. Once a year you “true up” with your utility where you settle the balance on your energy credit. If you consume more than you produce then you’ll pay the utility for the excess energy you pulled from the grid. If you produce more energy than you consume, the utility will compensate you for your excess energy at a below-retail rate. What are the key pieces of equipment for a solar panel system? Here are the most important equipment components to the standard solar panel system for your home. Solar panels are modular pieces, usually rectangular in shape – approximately 3’ by 5’ long. They vary in size, electrical output (measured in Watts), efficiency, and even color (most solar panels have either a black or silver metallic frame, and the cells will usually appear a dark blue or black in the light.) Panels can be mounted to a home or building’s roof structure, or installed on a ground-mount racking structure. The panels contain silicon cells that when exposed to sunlight, create a flow of direct current electricity or DC. Keep in mind: When thinking about where to locate solar panels for a home, it’s important to consider factors that will affect the system’s energy production (measured in kWh). In the Northern Hemisphere, facing south is typically ideal. The inverter is the device that converts (inverts, technically) the direct current electricity produced by the solar array(s) into usable alternating current, or AC electricity. There are several different types of inverters a solar installation might employ. String inverters are the simplest, most mature inverter technology, in which the DC from groups of solar panels linked in series are fed into the inverter. The inverter puts out AC electricity which is then fed to the home’s electrical infrastructure. Micro-inverters are small, modular inverters that are furnished behind each solar panel in an array (1:1) and effectively compartmentalize the AC energy production of each panel so that the reduced production of one panel does not affect the output of the entire system. It’s important that every residential solar system has a monitoring system. This is the system that will allow you to view and measure real-time and historical energy production data of your system. Some monitoring systems display this energy production data via a physical display unit, while others employ an online interface, or both! 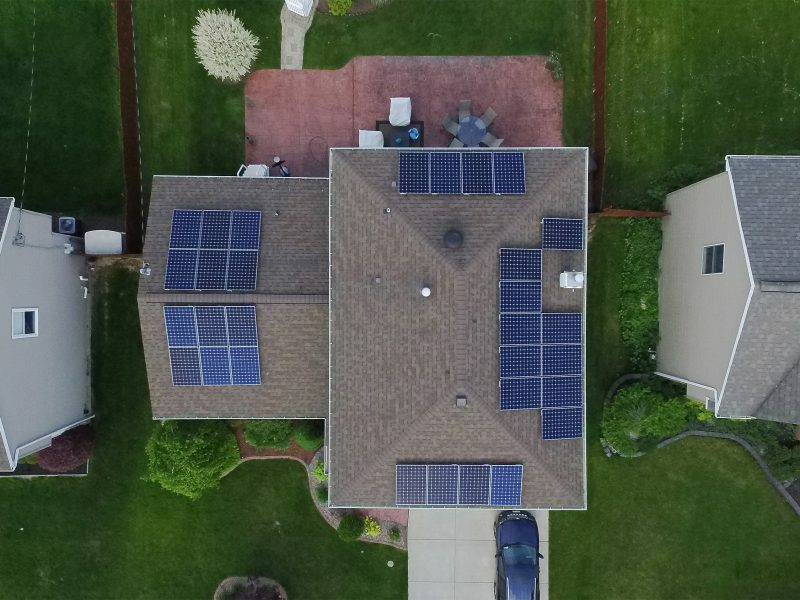 As “smart” or connected homes become more prevalent, solar installers can provide whole-house energy consumption monitoring as well. In order to ensure your solar system is producing energy normally, it’s important to make sure your solar panels are paired with an energy production monitoring system. A racking system is the structure on which your solar panels will be mounted to your home’s roof structure or on to the ground. While some racking systems may vary in their look, they exhibit similarities in their form and function. It’s important to make sure your racking system, if roof-mounted, is properly flashed and sealed to ensure your roof is well-protected against the elements. Roof racking systems vary slightly depending on the type of roof. Keep in mind: On flat roofs, a ballasted racking system can be used which requires no roof penetrations. 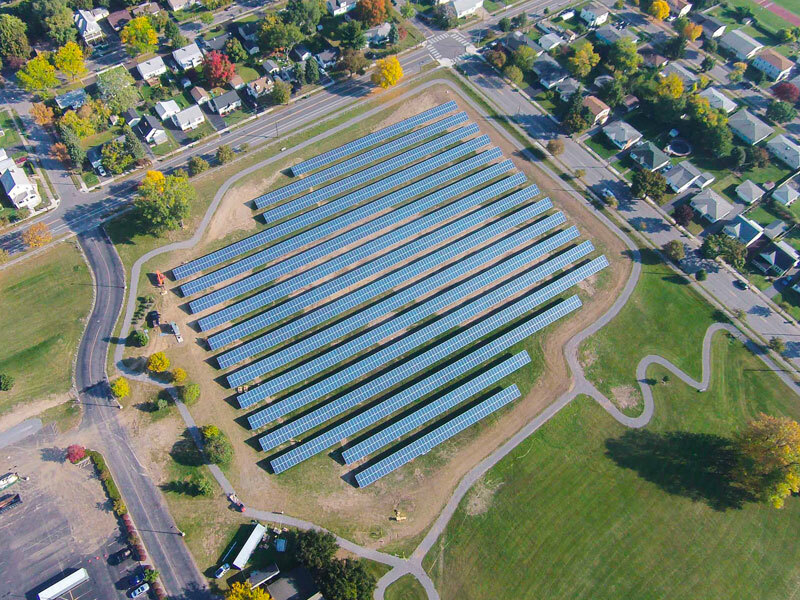 Solar Power in Buffalo, NY: Just the facts. There is not enough sunlight in Western New York. Solar panels are too expensive and aren’t worth it. My home won’t benefit from solar. These are only a few of the myths and rumors that are out there about using solar panel systems for your home or business. Solar by CIR has created a library of facts and educational resources to help dispell the myths about solar. Our goal is to empower you with the knowledge to determine your future with solar power. Do solar panels work well in cold climates? Most solar panels actually work best in cold, sunny conditions. Conductivity increases in cold temperatures, making electricity flow more efficiently, while higher temperatures can reduce the panels’ efficiency. As solar panels get hotter, they produce less power from the same amount of light. What if solar panels get more efficient, so I should wait to buy or install now? While many companies are working to improve the efficiency of solar panels, the current technology for solar panels is well established — in fact, we’ve been using the same solar technology, more or less, since the 1960s. The potential efficiency gains of future panels are small compared to the panels ready for installation today, and the efficiency gains when measured in total dollars saved on your energy bills is miniscule. How long should I plan on being in my home to ensure I make my investment in solar back? Depending on your system and location, solar panel arrays typically pay for themselves within 5 to 13 years. Solar panels also increase the resale value of a home considerably, so even if you won’t be in your home for the next 15 years, you can still see a significant return on investment when you sell. Do solar panels require a tracking system to follow the angle of the sun? When panels are installed, they are positioned to maximize sun exposure, meaning tracking systems are not required. Some newer solar arrays do integrate tracking systems to change the panel’s positioning throughout the day, but the additional expense and maintenance may not be worth the limited efficiency gains. Can solar panels operate in snowy or cloudy conditions? Snowy and cloudy weather can reduce the amount of energy produced by your solar panels, but they can still work efficiently in these conditions. In snowy climates, most solar panels are installed at an angle so that the snow will slide off the panel once it accumulates, and rain can help clear debris from your panels, actually helping them to be more efficient. In fact, Germany, a country that gets far less sun than Western New York, has one of the most successful solar initiatives in the world. What should I do if I’m concerned about the look of solar on my roof? Ultimately, the aesthetic appeal of solar panels on a residential roof is subjective. However, with the growing popularity of solar power, professionals can install solar panels in positions and locations to minimize the visual impact. Depending on your yard area, panels can even be mounted on the ground. Take a look at some of our Solar Installations. Solar arrays are built to be durable and require minimal maintenance. System performance will tracked by our monitoring systems so that you will know immediately if any piece of the system is underperforming and we can quickly fix the problem. All systems come with a 25 year warranty on all components as well. Other than an occasional rinse off in dusty conditions we don’t recommend any cleaning or scheduled maintenance. If properly installed and flashed, a solar system should not damage the existing roof structure. The purpose of flashing a solar array is to create a watertight seal that protects the home from moisture and leak damage. There will also be a third party structural analysis conducted to ensure that the roof structure can handle the active weight, wind, and snow loads of the solar array. If anything, the panels are protecting the roof structure below and will potentially expand the lifespan of the roof itself. The brunt of the weatherization on a roof comes from the sunlight hitting the materials. In most cases that means asphalt shingles so if you have solar panels installed on your roof, the panels will be taking the bulk of that sunlight and converting it to useable electricity for your home. What state and federal financial incentives are there for installing solar panels? Almost every state in the U.S. has some type of incentive for solar energy and New York is one of the highest rated. The owner of any system installed before the end of 2019 will be eligible for a tax credit of 25% of the cost of the system up to $5,000. The federal government is also offering a 30% tax credit for solar array systems installed before the end of 2019. In addition NYSERDA-SUN is offering to pay up to $0.35 per watt installed which typically covers between 10% and 15% of the total cost. Thus, in NYS we have incentives for residential homeowners cover nearly 65% of the gross cost of the solar system. Do solar panel systems require batteries? The majority of home solar power systems do not store energy in batteries. They’re connected to the power grid via net metering, and homeowners are credited with the energy that their solar panels generate and add to the electrical grid. Though it is possible to add a battery to your solar installation, doing so will increase the cost of materials, installation, and maintenance. What financial options do I have? Purchase Outright: This is by far the most attractive return on investment, especially if you borrow to finance the system. Generally, the savings generated will be much larger than the cost of the money borrowed. Purchasing a system qualifies customers for all rebates, tax credits, and revenue from Solar Renewable Energy Credit (SREC) sales, also, it significantly increases the property value of your home. Loan financing/short term: CIR works with a variety of lenders for bridge loans for your residential tax credits as well as other financial institutions for the net cost of your project. We are able to offer low interest loans, some with longer terms if you prefer, to make those payments less than what you’re currently paying for your electric bill. Please ask your CIR representative for a more specific breakdown. A Power Purchase Agreement or PPA is a contract between the customer and a third party financing company which owns, operates and monitors the solar equipment. In most cases, PPA’s are used when the interested party does not have the tax appetite or liability to take advantage of the federal and state tax incentives. Common projects types include: churches, schools, municipal buildings, fire houses, etc. PPA’s provide you with the long term savings with little to no money upfront. These projects also include system monitoring, maintenance contracts and a low fixed cost of energy. These particular energy systems hedge you against inflation and rising electric rates as well as provide a production guarantee. New York State’s Energy Research and Development Authority (NYSERDA) will provide a cash incentive currently paying $0.35 per watt for residential projects, and $0.45 per watt for small commercial projects under 750kW in size. Incentives vary for projects 200kW and larger. Call us today to find out more if you have a larger than 200kW project. Incentives will reduce periodically, as funding is committed and are subject to change. New York State will provide a 25% income tax credit up to $5,000 that can be used until fulfilled. Excess credit may be carried forward for five years. Qualifying solar energy equipment is eligible for a cost recovery period of five years. For equipment on which an Investment Tax Credit (ITC) grant is claimed, the owner must reduce the project’s depreciable basis by one-half the value of the 30% ITC. This means the owner is able to deduct 85 percent of his or her tax basis. is the loss of value that occurs over time when the object purchased is used for a specific use. As a business owner, you are eligible to deduct this “loss in value” from your taxable income when used for your business. If you are running a profitable business, and you can show that the solar power you are generating is for business use (as opposed to personal use), then it may have a strong impact on reducing your bottom line. Rural Energy for America Program – Renewable Energy & Energy Efficiency Funds may be used for the purchase, installation and construction of renewable energy systems, such as small and large solar generation. The USDA offers a loan with guarantees on up to 75% of total eligible project costs. Also there are grants available for up to 25% with terms of $2,500-$500,000. Applicants must provide at least 75% of the project cost (if applying for a grant only,) 25% of the project cost (if applying for load, or load and grant combo.) Projects greater than $200,000 require a technical report and energy efficiency project require an energy audit or assessment. Affordable Solar is a program being added to the NY-Sun initiative in an effort to reach out to low-to-moderate income (LMI) households. Those eligible will qualify for double the incentive that is currently being offered by NYSERDA capped at 6 kW. The income guidelines vary from county to county qualifying those who fall beneath 80% of the area or state median income. In order to qualify, you would also need an electricity efficiency assessment of the home to determine whether any lighting or heating/cooling upgrades are necessary to decrease your energy consumption before getting your solar system installed. If you are considering the option of adding a solar energy system to your home’s roof , while there’s no one-size-fits-all solar solution, here are some resources that can help you figure out what’s best for you. Consider these questions before you go solar. There are two primary technologies that can harness the sun’s power and turn it into electricity. The first is the one you’re likely most familiar with – photovoltaics, or PV. These are the panels you’ve seen on rooftops or in fields. When the sun shines onto a solar panel, photons from the sunlight are absorbed by the cells in the panel, which creates an electric field across the layers and causes electricity to flow. Learn more about how PV works. The second technology is concentrating solar power, or CSP. It is used primarily in very large power plants and is not appropriate for residential use. This technology uses mirrors to reflect and concentrate sunlight onto receivers that collect solar energy and convert it to heat, which can then be used to produce electricity. Learn more about how CSP works. Solar panels are built to work in all climates, but in some cases, rooftops may not be suitable for solar systems due to age or tree cover. If there are trees near your home that create excessive shade on your roof, rooftop panels may not be the most ideal option. The size, shape, and slope of your roof are also important factors to consider. Typically, solar panels perform best on south-facing roofs with a slope between 15 and 40 degrees, though other roofs may be suitable too. You should also consider the age of your roof and how long until it will need replacement. If a solar professional determines that your roof is not suitable for solar, or you don’t own your home, you can still benefit from solar energy. Community solar allows multiple people to benefit from a single, shared solar array that can be installed on- or off-site. Costs associated with purchasing and installing a solar energy system are divided among all of the participants, who are able to buy into the shared system at a level that best fits their budget. Learn more about community solar. Those interested in community solar can take advantage of a tool from awardee EnergySage. The company’s Community Solar Marketplace aggregates the many available options in one place and standardizes project information, allowing interested consumers to easily locate and compare multiple community solar projects in their area. There are a number of mapping services that have been developed by SETO awardees that will help you determine if your roof is suitable for solar. Solarize campaigns can also help you start the process of going solar. 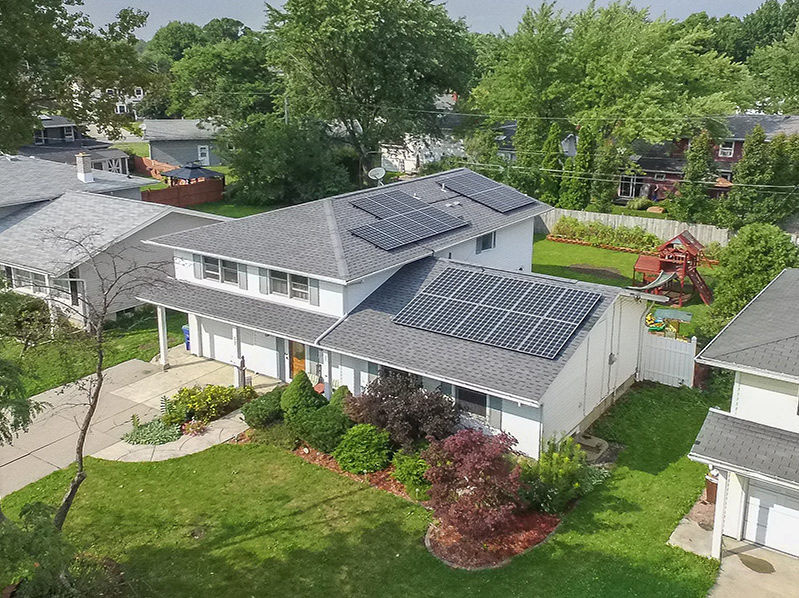 These programs work by allowing groups of homeowners to work together to collectively negotiate rates, select an installer, and create additional community interest in solar through a limited-time offer to join the campaign. Ultimately, as the number of residents who participate in the program increase, the cost of the installations will decrease. We suggest you start by taking our short quiz to find out if Solar is right for you. Right now, the best way to install solar is through a qualified professional, like us, who holds a certification to do so and works with high-quality solar panels. Contact us today for more info about going solar.